United Aircraft Corporation (UAC) is aiming to produce MiG-35 Fulcrum-F multi-role fighters for export by 2020. As per TASS, the Russian Air Force (VKS) will procure an initial batch of 30 MiG-35. The VKS aims to have the Fulcrum-F gradually replace its existing MiG-29 fleet. MiG Aircraft Company’s Deputy CEO, Viktor Chernov, was confident of the MiG-35’s export potential, citing “South and Southeast Asia, Latin America and African countries” as prospective markets. The MiG-35 is the latest variant of the venerable MiG-29 Fulcrum platform, which is both the mainstay of the VKS as well as a popular Russian export since the 1980s, especially in the developing world. Besides incorporating key improvements in electronics, most notably the inclusion of the Zhuk-AE active electronically-scanned array (AESA) radar, the Fulcrum-F also benefits from greater composite usage. This provides the MiG-35 with a substantially lighter empty weight than the legacy Fulcrum, resulting a longer operational radius (50% as per TASS) and payload (6,000 kg as per IHS Jane’s). 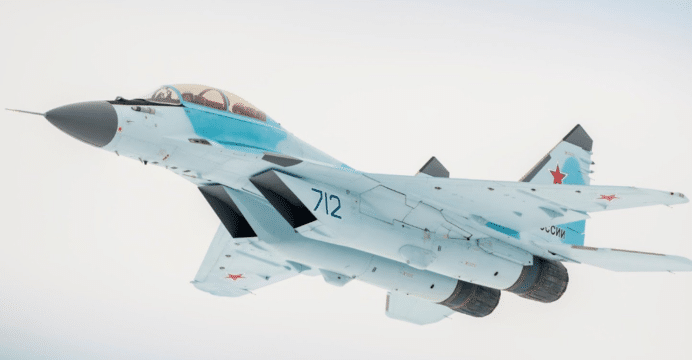 UAC has angled its MiG-35 pitch for the developing world market, which is flush with both legacy MiG-29s as well as even older fighter models from Russia, China, Europe and the U.S. When it formally launched the MiG-35, the MiG Aircraft Company’s Director General, Ilya Tarasenko, touted the MiG-35’s lower life-cycle (30-40%) and acquisition (20%) costs over its competition as key draws for the fighter, positioning it for traction in the market. The MiG-35’s principal advantages will rest in competitive cost and flexibility in terms of subsystem and weapons integration options. The VKS fulfilling its commitment to supplant its legacy MiG-29s with the Fulcrum-F will be critical in that it would generate outside confidence in the platform and greatly help scale the MiG-35’s development overhead. Currently, UAC is fulfilling a 50 MiG-29M/M2 order for Egypt, which ordered the fighters in a reported $2 billion agreement in 2016. The first Egyptian Air Force fighter was spotted flying in April 2017.